Dropped by Mission Hills to watch Lotta and Mark. She was playing in the ANA Junior Inspiration. Mark had forgotten his hat and his scalp looked as if it was fire. So, when he walked off the eighth green, he asked if I would pick one up in the pro shop. He handed over his debit card along with the PIN to secure the purchase. I said I had an extra in my car to save him some cash. I went back and got one but then I had a thought. Now that I have his PIN, hmm? How can I get my hands on that card again? As we were about to depart, I could not believe who came by in a golf cart. It was Stan Kowamoto, the caddie master from Portland. He and his crew are in town to manage Caddie HQ. Finally got rid of Dumb and Dumber. Went out to the course Tuesday. Almost expected to see Bully’s familiar face greeting all who arrived. Sad. Went out again Wednesday and had a good possibility for a bag but blew it off. Just not feelin’ it this week. Will hit the hiking trails instead. Hiked the Clara Burgess to Murray Hill Trail yesterday for the first time. 7.1 miles, 2,076-foot elevation gain and took almost 4 hours. Quite a ball-buster. At least for me. I was drained at the end. Could not drink enough. The one Ultra did help though. There were two picnic tables at the top and plenty of dog crap on the trail. Just thought I’d mention it. Decided to take it a little deeper on yesterday’s hike. Went up the Araby Trail then onto the Berns. Thanks to the AllTrails app, I kept going and looped around to the Araby for my descent. Took just under three hours and traveled 5.9 miles. Even after a couple months of leg workouts back in Tampa, it’s just not the same as doing a hike. My wheels need a rest. Did the Frank Bogert Trail (not to be confused with the Humphrey Bogart who explored Bacall Canyon one or twice) yesterday but without my new hiking sticks. I had emptied my trunk to make room for goods Dave was donating to charity. No problem though. No slips. I tried the Araby first but there is very limited parking and being a Saturday, early arrival is a must. Had to find an alternative. Still no luck on a loop for Beaumont. A call was never returned. Normally, I would rest after the first hike but not this time. I did the Bump and Grind Loop Trail yesterday. I learned last year that clockwise was the way to go. The first half is steeper with the descent downright benign. There were many on the trail that did the opposite and found the loose soil – without proper shoes – challenging. Children were guided by their watchful parents and one husband was hand-holding his spouse as she clenched a boarding boulder for dear life. One thing that bugs me is the lack of hiking etiquette. Basically, it’s due to ignorance (I didn’t know it last year either) but the hiker going up has the right of way. Many parts of the trail are squeezed to accommodate shoulder-to-shoulder trekkers but so many people coming down don’t give it a second thought. I just move aside and say hello. At the apex of the trail, I heard “Hey, look at that”. It was a sight not normally seen from what I was told. 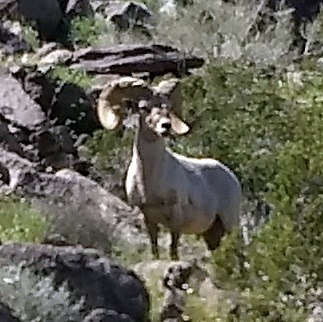 A large ram, graced with a pair of trophy horns stood majestically 20-30- yards up the hill. We all stood in reverence taking in his splendor. On the way from Tampa, I listened to the audiobook In Cold Blood written by Truman Capote. It’s about the murder of the Clutter family committed in 1959 in the city of Holcomb Kansas. I’ve watched the movie “Capote”, which covers the crime and drew me to the book, multiple times. Phillip Seymour Hoffman’s portrayal of Capote was brilliant. Holcomb is only seven miles from Garden City where a Symetra event takes place. That’s another reason for my curiosity. Familiarity with the surroundings was a plus. The next book on the agenda was Einstein: His Life and Universe. Way too much physics for me but he did live a very interesting life. You need to be a genius to understand much of it. I still have a way to go but it’s better than static or the drone of the same old music over and over. Just like last year, Volunteer Dave has graciously welcomed me into his Rancho Mirage abode for an extended stay. Dave won’t be here until the ANA so I have the place to myself. I departed the Tampa area Monday and arrived midday Wednesday. First stop was Katy Texas just west of Houston. Then on to Deming New Mexico and finished up with an alternate route through Yuma Arizona. I wished to avoid the morass of Phoenix traffic and take a route past the Salton Sea I had never experienced. As usual, the trip was arduous but uneventful except for one incident. A guy passing almost clipped me, going well over his designated lane. I swerved and blew the horn simultaneously only to notice his head in a downward position. Had to be texting. I truly missed hiking the scenic trails in the area (Florida is flatter than a short stack at IHOP without the coffee) so it didn’t take long to get back on the horse. I hit the Araby Trail yesterday and was surprised to find many fellow trekkers. By the lack of preparedness, most were obviously novices. No water, hats or hiking aides although the latter may or not be necessary. I’m referring to proper shoes and trekking poles. Poles definitely aide in climbing but are even more valuable descending. When the legs get rubbery on loose soil, an accidental slip-n-slid may cost you dearly. So, after last year’s experiences, I decided to purchase a pair. Of course, Amazon was my go-to e-tail store. My first choice arrived damaged so they were returned. I didn’t like the construction either so I opted for a pair of Alpine Summit Hiking Poles. With only one hike under my belt so far, they get five stars. My first climb of the season was much easier than last year. My buddy Mark Scott put me through the wringer. Thought my heart was going to burst through my chest like that creature in Alien. As I said, many neophytes were out for a day walk but with only a couple hundred yards remaining, I noticed a curious group ascending in my direction. It looked like a three-generation family led by grandma, helped by one of her children, and trailed by dad with a puppy on a leash. Don’t know how far up they were planning to go as grandma was hunched over and her breathing was labored. Her physical stamina was surely in question but maybe that was the master plan. I’d like to see a copy of her will. The Symetra Tour is in Beaumont next week and I’ll be looking for a loop. Mark has given me a couple bites so I got that going for me. The forecast looks dry but cool mornings are in the offing. You are currently browsing the Life on Tour blog archives for March, 2019.